He was known to be a Buddhist leader, philanthropist, a gentleman politician. Best described as multi-faceted, he was the first served in the cabinets of D. S. Senanayake and Dudley Senanayake, the first Leader of the Senate, a founding father of the Colombo Plan, one of six signatories to the historic document of the National Flag Committee Report, an Ambassador to France in 1965 and a High Commissioner to the U.K. in 1967. This was the late Sir Lalita Rajapakse who passed away on May 26 1976. It is my privilege to write this tribute as a grateful client for whom he appeared free-of-charge, as an eminent and distinguished Appeal Court Lawyer in his heyday. Born at Herambe Walauwwa, Balapitiya, he founded Revata Vidyalaya, now Revata National School over seventy years ago when he was only 33 years old. He also donated land in Okadawatte where the first Teachers Training College in Balapitiya was established.Venerable Migettuwatte Gunananda Thera whose fame for oratory in the "Panadura-Vaadaya" (a famous debate in support of Buddhism) hailed from Migettuwatte, in Balapitiya. The monk's statue stands prominently in Panadura as a mark of respect and admiration by the people of the area. Sir Lalita felt the need to erect another statue at his birthplace, out of loyalty to the people of Balapitiya. Public funds enhanced Sir Lalita's own munificence and this second statue of the Venerable bhikku stands proud on the Galle Road frontage of Migettuwatte. As a founding father of the Colombo Plan, I wish to elaborate, A co-sponsor of the Colombo Plan, Sir - Percy Spender, Q.C, the distinguished Minister of External Affairs in the Robert Menezies government of Australia and later President of the International Court of Justice wrote a book called Exercises in Diplomacy. Page 202 of this book refers to sir Lalita Rajapakse as follows. I quote: "Heading the Ceylon delegation was Senator Dr. L. A. Rajapakse, K. C. Minister of Justice, an able and delightful man whose eloquence was matched only by his faultless English diction - a matter of surprise to at least one member of my delegation who could not reconcile himself to the idea that an Asian could excel him in his own language." What a tribute! Rajapakse began his education at Ananda College and later was at St. Joseph's College. He entered London University in 1920 and obtained the degree of Doctor of Laws in 1925, thus becoming the first Ceylonese and probably the youngest. In the 60's when he was Ceylon's High Commissioner in the U.K. this distinguished alumnus of London University was conferred the rare honour of being made a fellow of the University and his portrait hangs in the "Hall of Fame" of this great seat of learning. In 1944 he was conferred Silk-king's Counsel, and later Q.C. 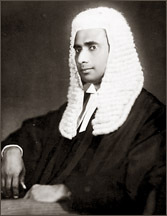 After serving two cabinets as Minister of Justice he reverted to the Bar in 1953 or so, and was known as one of the leading Appeal Court lawyers. At. 60, he decided to give up a lucrative practice, and being a practising Buddhist he served three years as the President of the All Ceylon Buddhist Congress, from 1960 - 1963. In this Presidential address at the Ratnapura sessions he asserted that "If a person became a public man or a leader of society, his life both public and private must be free from moral blame. As a buddhist leader he gave counsel to both Vidoydaya and Vidyalankara chief monks, as he was a member of both their governing bodies. The Board always valued Sir Lalita's view point. On February 4th, the newspapers print facts of our National Flag. The late Mudaliyar Sinhalebbe of Batticoloa rose in Parliament on January 16, 1948 and moved that the Royal Standard of our last king which was removed to England after the Convention of 1815 be once again adopted as the official flag of free Lanka. Our first Prime Minister D. S. Senanayake on March 6, 1948 appointed a seven member Flag Committee and Dr. L. A. Rajapakse (later Sir Lalita) was one such. S. W. R. D. Bandaranaike, J. R. Jayawardene Sir John Kotalawela T. B. Jayah, G. G. Ponnambalam and S. Nadesan were the others. These appointees were to advise the prime minister. After several sittings, with the exception of Senator Nadesan, all the other members signed the Report. On Page 22 of the book on the National Flag and the National Anthem by Mervyn Herath you can see the signatures of the National Flag Committee members. On the 31st death anniversary of this multi-faceted personality I conclude, wishing sir Lalita Rajapakse the Bliss of Nibbana!